I try my darndest to recycle (and reduce and reuse), but last weekend, I got some warm fuzzies due to a series of exchanges with folks both online and in the real world. My current set of “raw” walnut tealights are made from San Jose walnut, but as those have been strong sellers, I’ve been looking for some more walnut cutoffs or logs. Via Craigslist, I found a woodworker in Albany who had partnered with an arborist to find better uses for “good” wood than the compost heap. He had the better part of a tree in his driveway, and I picked up a few logs for free, which will get me through another season. … as these tealights or something similar. Odd shapes of scrap hardwood - what to do?! 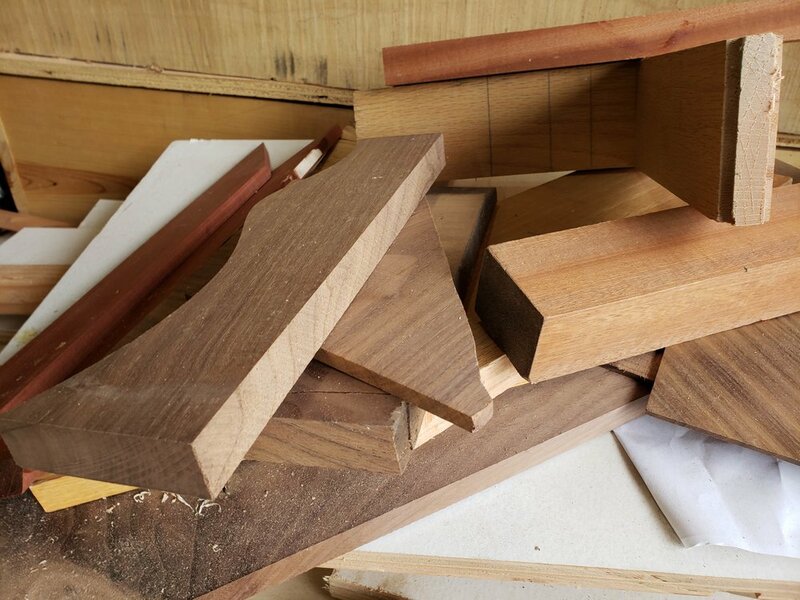 I’ve been collecting growing bins of beautiful “good” scrap wood - everything from walnut & oak, to wenge & padauk. Even a little bit of teak! It’s too nice to compost. Though I’ve delivered some to fellow artists who do wood jewelry, this listing hasn’t done too well, so it has been accumulating for years! Oakland’s Depot for Creative Reuse - a gem for artists, school projects, and ideas - couldn’t use it, so on a lark, I brought it to Urban Ore, a much more industrial size (and style) business in Berkeley whose goal is to “end the age of urban waste”. I hadn’t even handed the bins off when a shopper - thinking I was purchasing those for myself - exclaimed “I want those! Where did you find them?” She teaches arts and crafts to 4 -5 year olds on the East Bay, and was excited for all the colors and shapes. Those giant boxes didn’t stay at Urban Ore for long! And finally, in looking for a new home for three barrels of “bad” scrap wood - cut down pallets, construction grade pine, unusable shims, and so forth - I found someone advertising that he’ll gladly take old wood fences, 2x4s, etc., as he turns them into his own art & furniture. Unfortunately, my remaining scrap wouldn’t work for him, but it made me happy to find an artist turning what many would haul to the dump, into beautiful pieces.